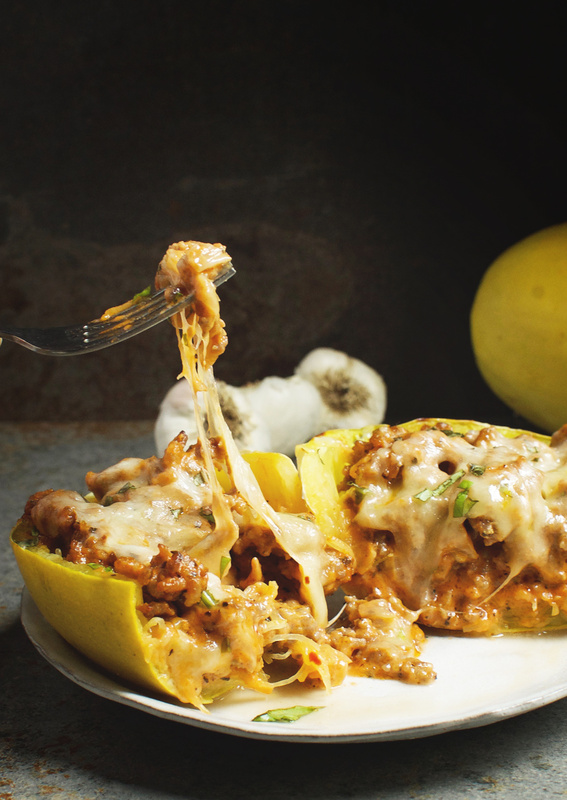 This recipe for Sausage Stuffed Spaghetti Squash takes low-carb eating to a new level! This delicious recipe works for low-carb, ketogenic, gluten-free, grain-free, diabetic, or Banting diets. 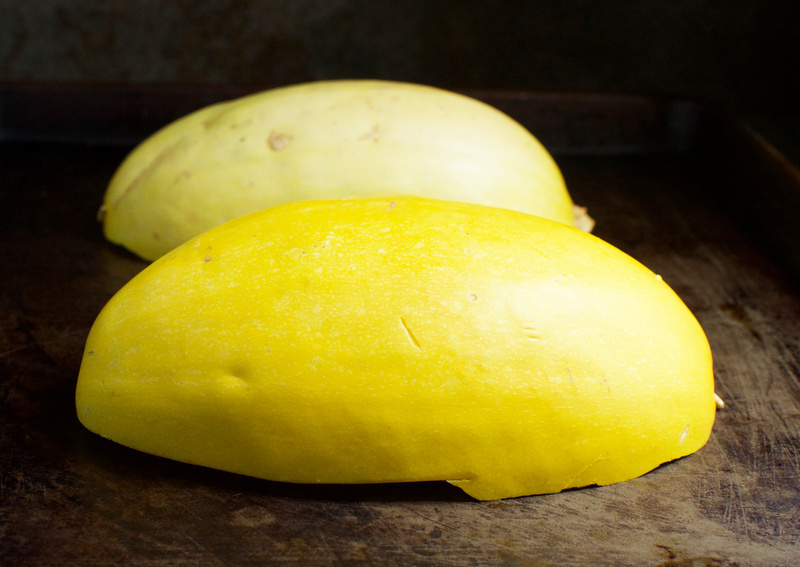 I grew up with spaghetti squash. Spaghetti squash plants in our garden produced squash faster than we could use them My mom always prepared it so the end result was almost like spaghetti. 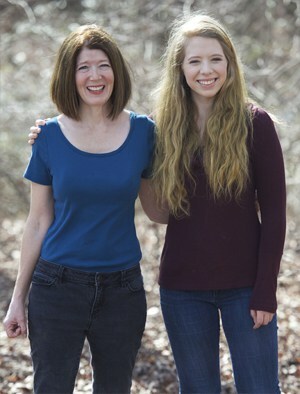 She would bake the squash in the oven, then scrape it out of the shells and into a bowl. She would serve it with her regular spaghetti sauce and we would spoon the squash on our plate and spoon the sauce overtop. I remember pouring spoon after spoon of sauce over the squash. I tried to scoop it so that I would get the most meat I could in each spoonful of sauce. 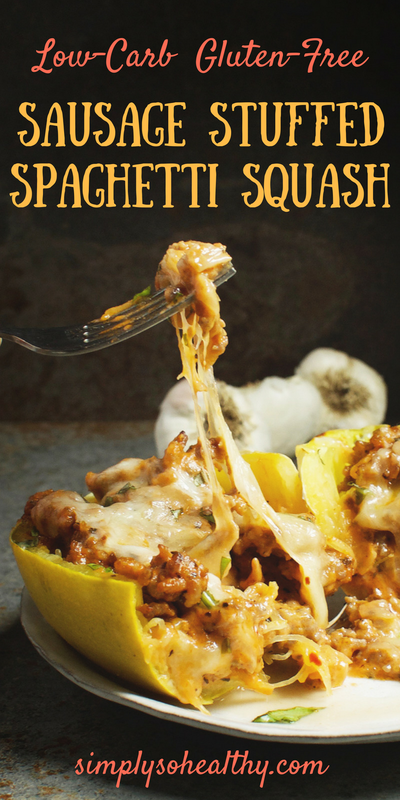 This recipe is a bit of a reaction to feeling like I could never get enough meat on my spaghetti squash. 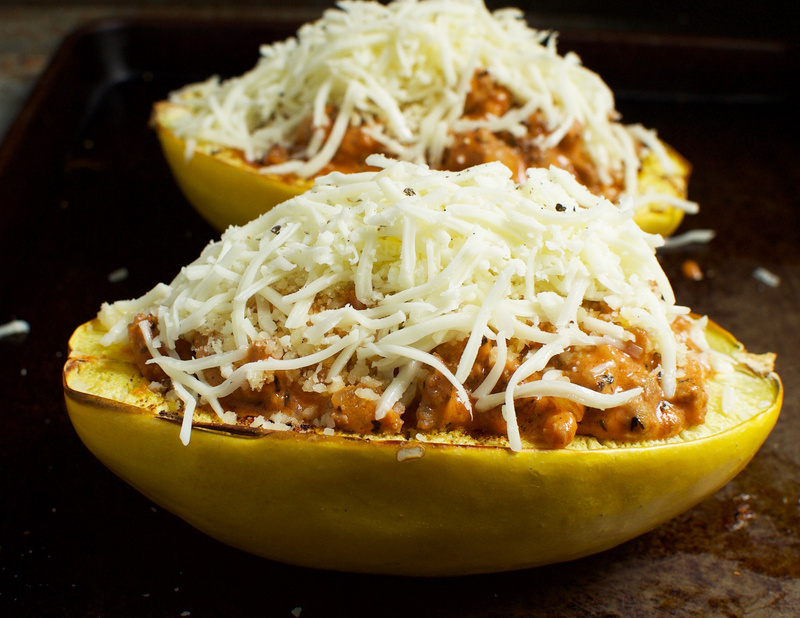 In this Sausage Stuffed Spaghetti Squash recipe, the squash overflows with a filling of sausage in a creamy tomato sauce. The tomato sauce brims with Italian flare with notes of basil, oregano, and garlic. The end result is a lot like the spaghetti I remember as a kid, except a whole lot better! This is a recipe for those who like a little sauce with their sausage and a little spaghetti with their sauce. Yep, it’s about pure indulgence. That’s the kind of meal I’m talking about. Even though this meal has homemade sauce, it comes together easily and quickly! To save time, I make the sauce and grate the cheese while the spaghetti squash is baking. 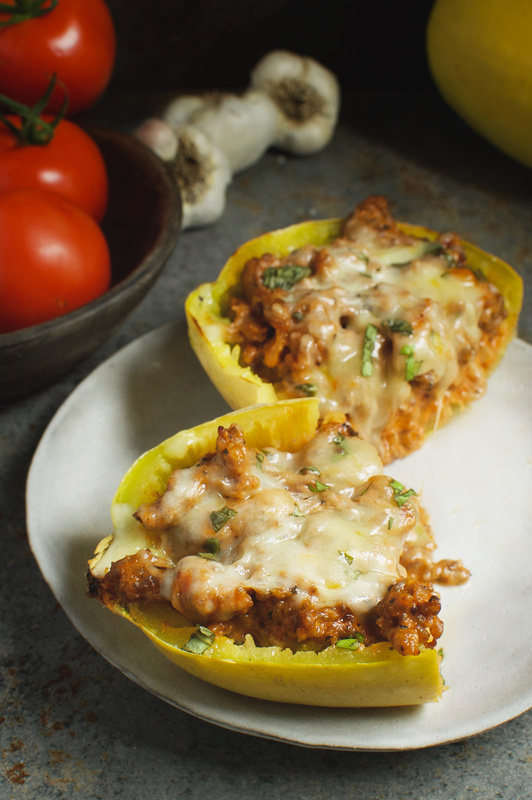 When the squash has baked until it’s tender, just fill it with the sausage and sauce, top with the cheese and pop it back in the oven for a few minutes to melt the cheese. 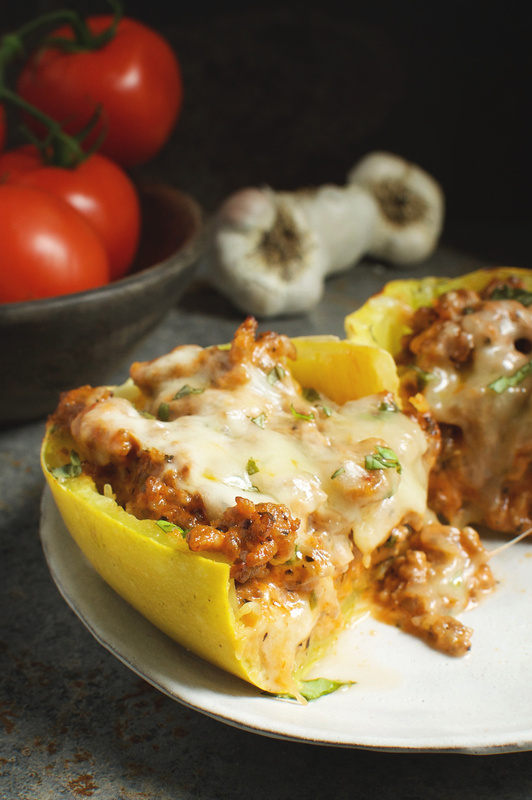 This Sausage Stuffed Spaghetti Squash recipe pleases everyone in the family, whether they eat low-carb or not! No need to make a separate meal for the kiddos. Enjoy! Preheat oven to 350º Fahrenheit. Cut squash in half lengthwise and discard the seeds. Spray squash lightly with coconut oil and sprinkle with sea salt. Place cut-side down on a baking sheet. Bake squash 35-40 minutes or until tender. Using my oven, 35 minutes makes the squash noodles al dente, and 40 minutes makes them more tender. Test doneness by inserting a fork. If the fork slides in easily, the squash should be tender. Remove from oven. While squash is baking, prepare the filling. Heat a large skillet over medium high heat. Add butter. When butter stops foaming, add the onion. 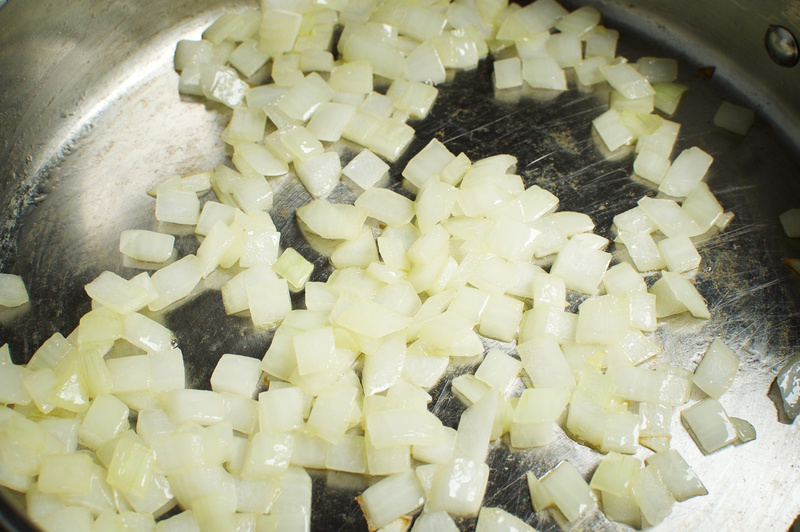 Cook onion, stirring occasionally, until onion is just starting to brown and starts to become translucent. 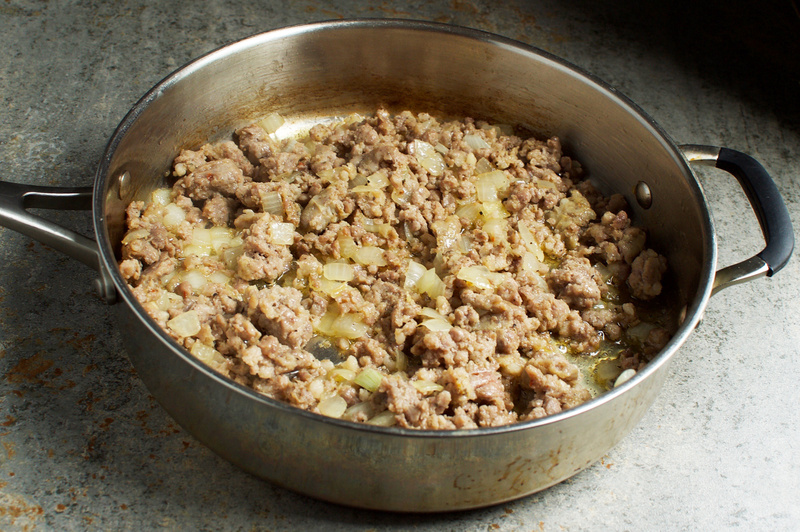 Add the ground sausage. 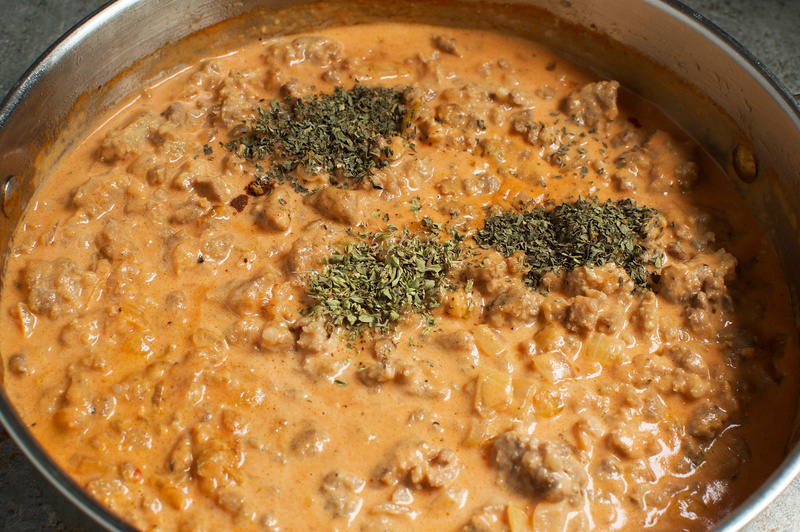 Cook sausage mixture, stirring occasionally, until sausage is browned and cooked through. Drain and discard excess grease. Stir in garlic and cook for one minute. Add tomato sauce, whipping cream, basil, oregano, red pepper flakes, black pepper, and sea salt. Stir until sauce has thickened. Taste and adjust seasoning. Set aside. 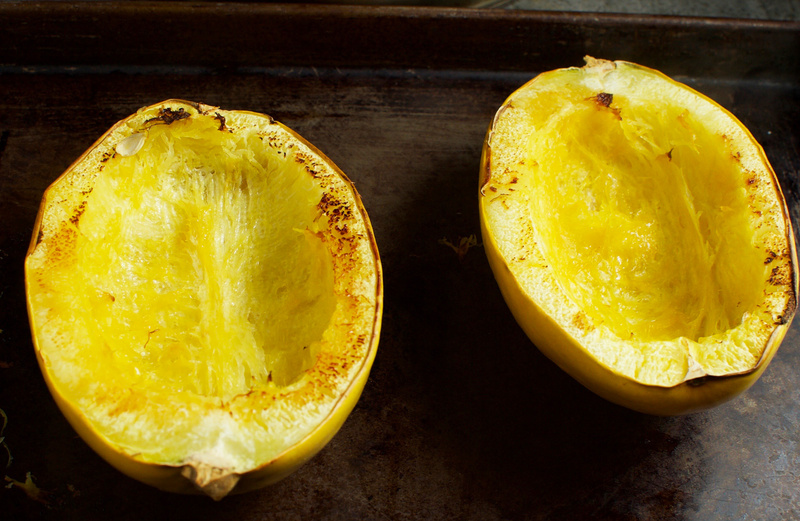 When squash has reached the desired level of tenderness, remove from the oven. Increase oven temperature to 400º Fahrenheit. Turn each squash half using tongs or oven mitts, so that they are on the baking sheet with the cut side up. 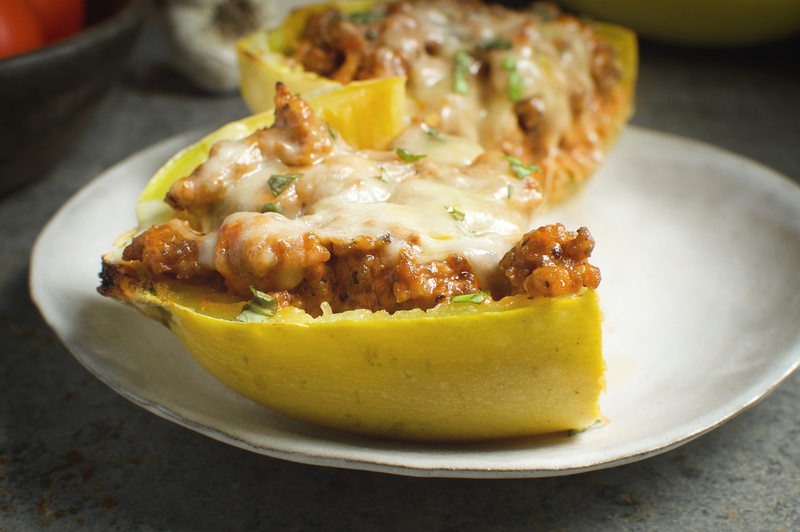 Fill the squash halves with the sausage mixture, then sprinkle 1 tablespoon parmesan cheese and 2 tablespoons mozzarella cheese on top. Bake in 400º oven for about 5 minutes or until cheese has melted. To serve, cut each half into three pieces, or scoop the squash and filling out of the shell. Thanks so much for your feedback! I’m glad you enjoyed the taco pie and the taco seasoning! I think it would be fine to scoop out the squash and mix it with the sauce, then put it back in the shell and bake it. You may want to keep some sauce to put on top. Good luck with your low-carb lifestyle! I did what you recommended like a 2x baked potato. Used ricotta and heavy cream. Was awesome! No problem with the shell – it was crispy and everything came out after the second time in the oven. oh my goodness. you guys are genius’s. I just made the spaghetti squash and it is fabulous. I was just wondering what I could use as an alternative to coconut oil as I am allergic to coconut ?? You could just brush them with melted butter, ghee, or olive oil. Good luck! LOVE this recipe! Thank you so much for sharing it! I was in a big hurry, so microwaved my squash halves for 8 minutes. This recipe is perfect! I LOVE this recipe and have made it many times! Excellent!!! Thank you! 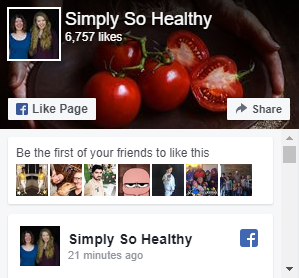 Glad you’re enjoying the recipe! 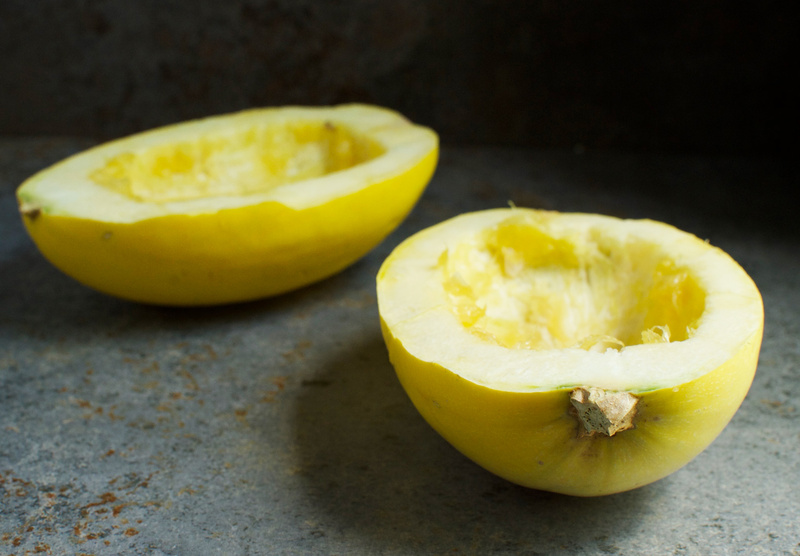 It’s my favorite way to make spaghetti squash!